Well, hello darlings! My name is Brooke Guerra of Basically Brooke blog and I am originally from the beautiful Smoky Mountains of east Tennessee, but most recently I reside on the Gulf Coast in Mobile, Alabama. I’ve lived abroad for short periods of time and find myself very inspired by international fashion, especially the French and Italian! My personal style is somewhat eclectic, often mixing vintage pieces with newer trends. I absolutely love anything girly and am not scared to wear some funky shoes with large stiletto heels to even the most mundane outings. I always aim for balance though and while I may be wearing some crazy shoes; my outfit would be plainer so I could let the best pieces shine! I love a fun print (as you can see!) and I am never scared to branch out as long as I am feeling confident in my look. I would say that I am also drawn to clean, classic looks though and I have no shortage of little black dresses I can wear at any given time. I think my love for fashion began when I was young, when I would watch all the old Hollywood sirens like Grace Kelley and Elizabeth Taylor completely take over the scene with their beautifully fit clothes. They had a true way of being feminine and powerful all at the same time. I have always thought about doing some creative writing and along with my love for photography and fashion, the idea to start a blog just came together. There was also some encouragement from friends and family who need their current updates on all things Maebelle, my pet piggy! She is always into something and we have some really fun adventures together. On BasicallyBrooke.com, you will find a variety of things such as fashion, travel, Maebelle, and wedding ideas. This design just called my name out as soon as I saw it! I love anything pink and I even have pink Victorian chairs in my house. I could totally see this design for my own home! 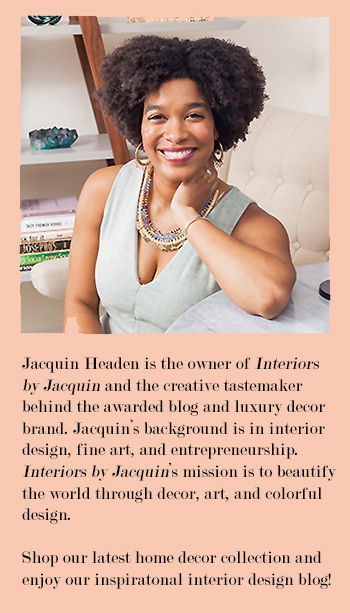 I also felt like the starfish on the mantle gave this room a feeling of an uptown, glamorous beach house. 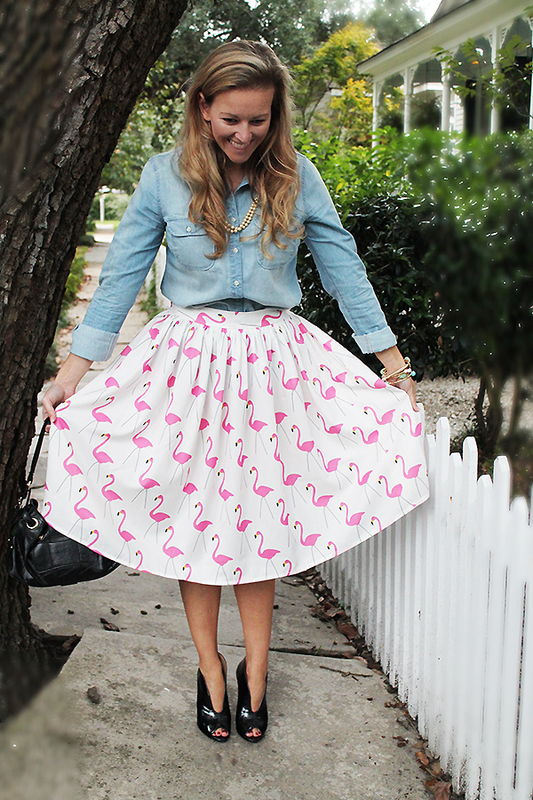 Since we live on the Gulf Coast, it was very easy to imagine spending time in this room rocking my flamingo skirt! The thing about our location is the weather is still in the 70s and 80s right now while the rest of the country starts to see cooler temperatures. I am always trying to create looks that take more summery pieces and transition them into fall since we don’t have a reason to suddenly wear sweaters. One of my favorite things on trend that helps this transition is booties! They give a little bit of a boot while keeping your skirts from looking bogged down. I also love wearing skirts with longer sleeved shirts and of course, darker accessories complete the look. 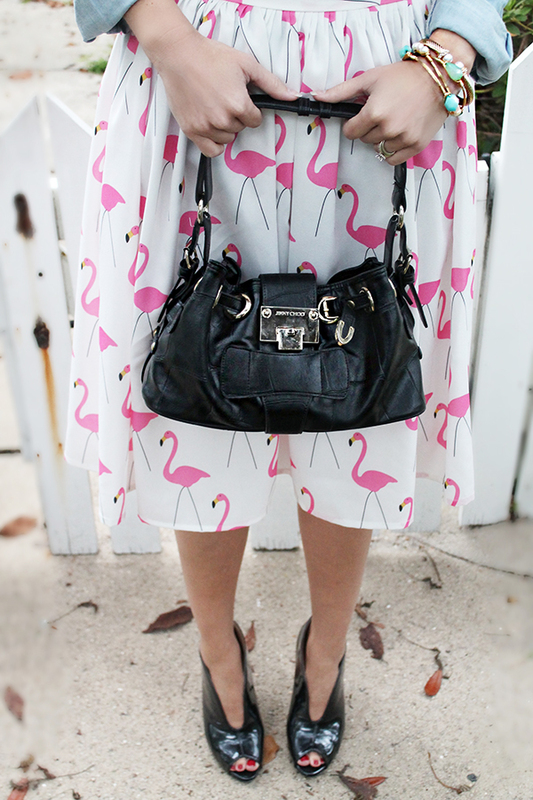 By having the balance of a cute flamingo print with the Jimmy Choo purse and patent leather booties, the outfit has more of a fall feel but still reflective of where we live. I actually really like bright prints even in the winter time, although some may shy away from them. For this interior design, I felt like the bright pink flamingos complemented the pink chairs and ottoman well. The fun vintage photo over the mantle also fits well with my retro midi-style skirt! 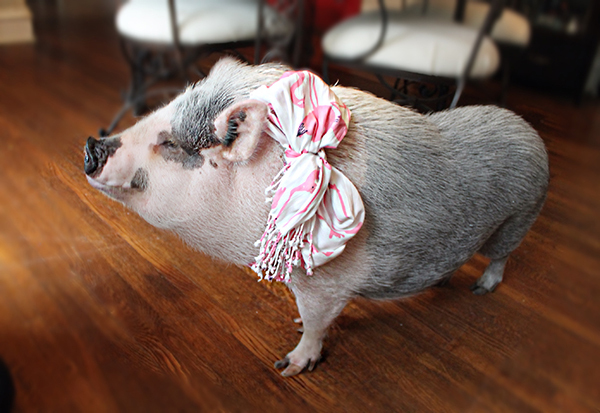 Even MaeBelle got into the swing of things with her chic, matching Flamingo scarf! 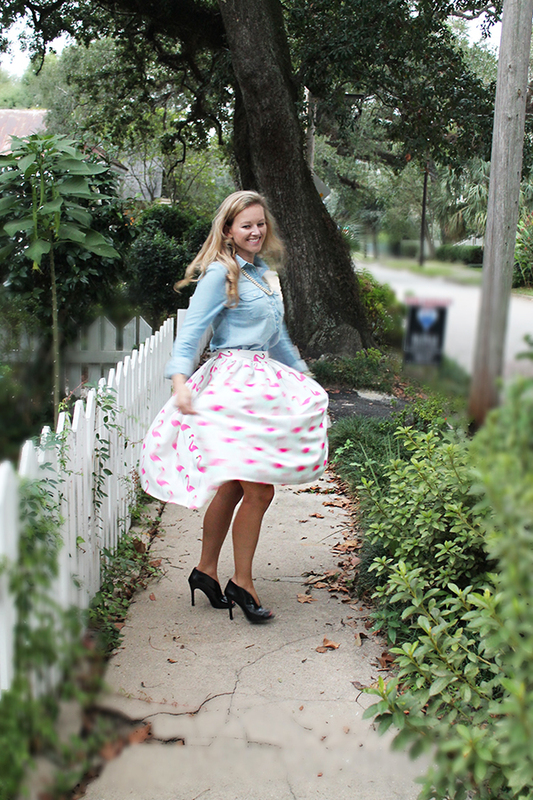 This skirt can be styled so many different ways! I had even thought about gold accessories instead of pearls and wearing some hot pink studded pumps (Think Valentino Rockstud pumps…) if you wanted to glam it up for a night out. Those are always the kinds of pieces you want in your closet to get the most use out of them.. The link I included for the Jimmy Choo purse is going to take you to resale site for designer goods. I personally love a good deal and will always opt for designer on a dime. If you have never heard of Tradesy, you are going to love it! 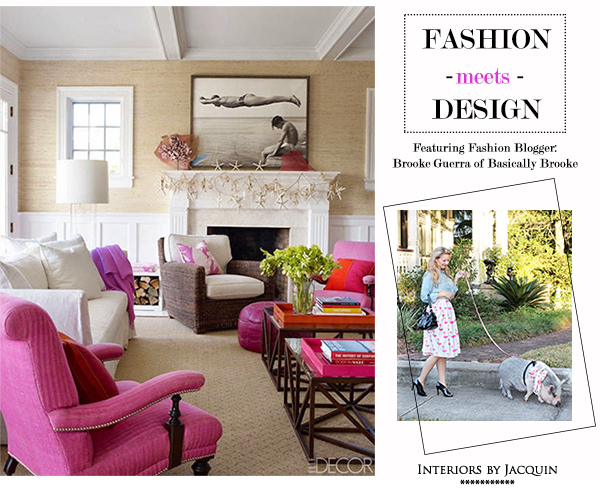 Learn more about Brooke and her love of fashion at her fab blog, Basically Brooke. Maebelle will be there to greet you too!